If you require Sound System Hire, Lighting Hire or Stage Hire for your wedding, Soundwave Audio can help. Working across Oxfordshire, Warwickshire and Northamptonshire, we are the experts that can make your wedding venue look and sound great! From small PA systems with radio microphones for speeches and background music to powerful sound systems for bands and DJ's, we will ensure your wedding day sounds great! We can also provide stage hire and lighting hire too! Equipment can be delivered to your venue if required, or you can collect and return from our base in Banbury. Technical crew can be provided to setup and operate to ensure your wedding runs smoothly and is stress free. PA Hire for Bands and DJ's at Weddings. 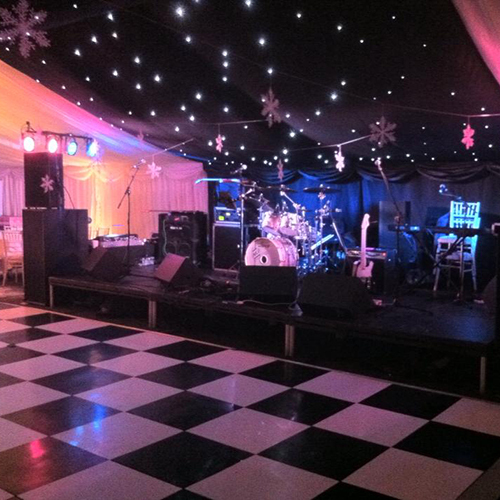 We specialise in providing quality sound system hire for bands at weddings. Equipment is delivered to your venue then setup and operated by one of our experienced sound engineers. Hiring a PA system for your band or DJ from Soundwave Audio ensures your event will sound fantastic! PA systems from Turbosound, Miltec, Shermann and Proel. Amplifiers from FFA, Crown and QSC. Mixing desks from Allen & Heath and Soundcraft. Microphones from Shure, Senheiser, Audix, AKG, Audio Technica and Beyer Dynamic. From 1KW to 20KW, 1 monitor mix to many. Wedges or IEM's. Indoors or outdoors. Send us the technical requirements for your band or just ask them to contact us directly and we will quote for the hire of all of the audio equipment required. Why not Contact Us to discuss your event in more detail. Just need some speakers to play your own playlist through? Take a look at our DIY Disco Packages. These simple to use systems allow you to plug in any mobile deivce and turn your playlist into a disco that looks and sounds fantastic! 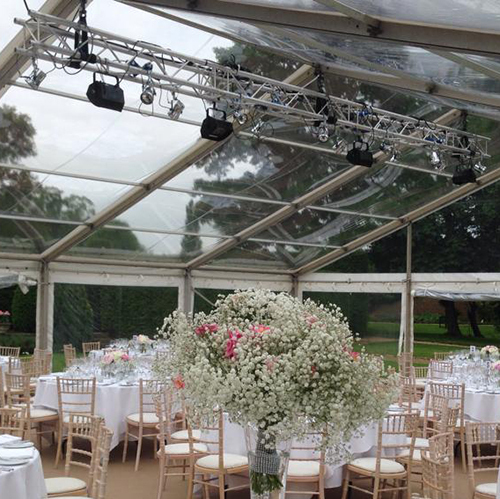 Soundwave can create an exciting and vibrant lighting design for your wedding venue, both indoors and outdoors. We then provide all of the equipment and crew to make it a reality. 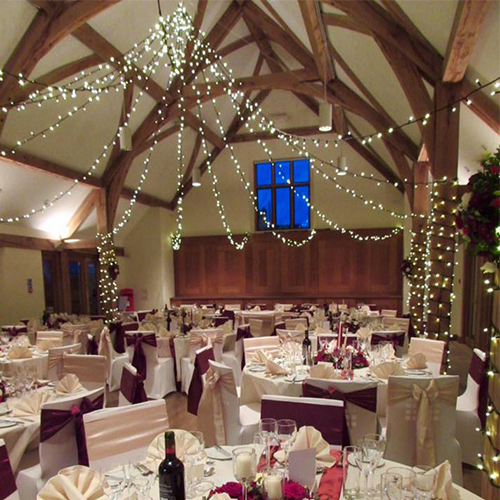 We want to make your wedding venue look fantastic for the big day! 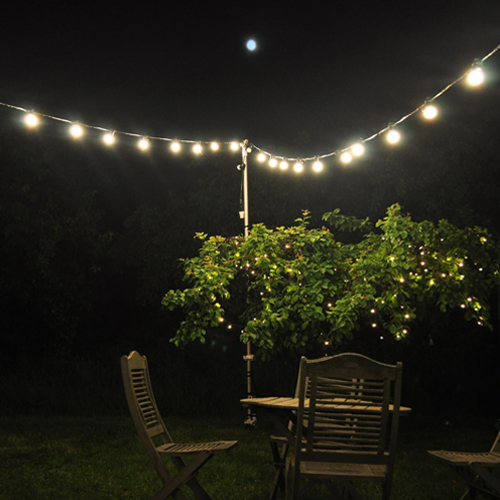 Fairy Lights, Rope Lights, Festoon. Disco Lighting & Stage Lighting from Martin, Jands, Avolites, Thomas and Chauvet. Indoors or outdoors. Large or small. Let Soundwave look after the lighting hire for your wedding. See our Lighting Hire page for more details or Contact Us for a quote. If your wedding venue doesn't have a stage, we can provide a portable stage system to create a raised area for your band or DJ to perform on. A wide range of stage sizes and heights are available. See our Stage Hire page for more details or Contact Us for a quote. We provide PSound System Hire, DIY Discos, Wedding Lighting and Wedding Stage Hire within a 1.5 hour radius of our base in Banbury. Our equipment is regularly hired in Oxfordshire & Warwickshire. This includes: Banbury, Brackley, Buckingham, Towcester, Northampton, Milton Keynes, Daventry, Bicester, Oxford, Wallingford, Thame, Didcot, Abingdon, Kidlington, Woodstock, Witney, Burford, Chipping Norton, Bloxham, Gaydon, Warwick, Leamington Spa, Stratford-upon-Avon, Birmingham and Coventry.